As usual I was in Miami working on various web sites for my friend David. Around 1am I took a break and went to my favorite Japanese restaurant, Hiro's Yakko-San. I have sushi quite often but this isn't a sushi bar. You won't find sushi rolls on the menu but you will find an amazing selection of authentic Japanese cuisine. This is the place the sushi chefs go when they get off work. 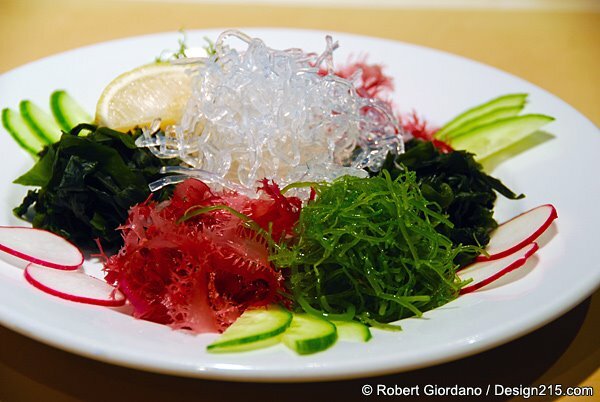 I started off with the seaweed salad pictured above. I had to take a picture of it before I ate it. It comes with ponzu and spicy mustard sauces on the side. I come to bury Caesar, not to praise him..."
There's a new product on the market called the Kindle, made by Amazon. It's a handheld device that lets you read books electronically. It has several features that set it apart from other eBook readers. Probably the most important of these is its ability to download electronic versions of books and newspapers wirelessly. It can connect anywhere there is a cell phone signal because it uses Sprint's EVDO network. There is no wireless bill but you cannot make calls and web browsing is limited. The Kindle doesn't use an LCD screen like laptops, PDAs, or cell phones. Instead, it uses a new technology called Electronic Ink or E-Ink. Basically the screen consists of millions of microcapsules that have a black side and a white side and flip depending on the electronic output. Since the screen uses physical particles, there is no problem reading it in direct sunlight, but it also means you'll need a reading lamp in the evening. Since the display doesn't constantly give off light like an LCD screen, it uses much less power. Finally, because the particles only flip between black or white, it cannot display color. 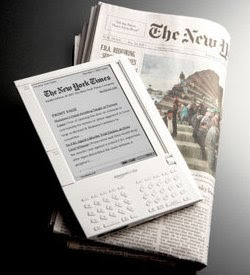 The Kindle is not the first to use E-Ink. You can read about other devices here. Keep a large number of books in one small, portable device. Font sizes can be made larger or smaller for easier reading. Books, newspapers, and magazines can be downloaded wirelessly anywhere a cell phone works. All text can be searched and pages can be bookmarked. The screen is easy to read, especially in bright sunlight. Battery charge lasts for 5 days or more when not using wireless. The New Oxford American Dictionary is built in so you can easily look up words. More than 190,000 books, 11 major newspapers, and 8 magazines are available for download. There is free wireless access to Wikipedia.org, many blogs, and other web sites. If you lose or break your Kindle, a record of everything you've purchased is saved on Amazon's servers so you can download all of your books again for free. Content is encrypted. This is called Digital Rights Management or DRM. Books cannot be downloaded to a computer, shared, or printed. You can copy a clipping of text to a special file and transfer it to your computer but you cannot transfer or share whole texts. You aren't buying a book. You are buying the rights to read a book on your Kindle. There is a fee (10 cents per document) for uploading your own files to your Kindle because they have to be converted to a special format first. You must first email them to your online Kindle account, then they are converted and sent to your Kindle. You can't loan someone one of your books without loaning them your entire Kindle. You can't transfer books you've read to someone else's Kindle unless its on your account and connected to your credit card. You can have up to 6 Kindles on one account. Currently you cannot get magazines and newpapers you already subscribe to on your Kindle for free. For example if you already subscribe to The New York Times and want it on your Kindle, you have to purchase a separate subscription. There is no color. All illustrations are black and white. Web sites are rendered similar to other mobile browsers but with no color. Many people who otherwise like the Kindle have complaints about the controls. You can read some here and here. You can loan them to friends or give them as gifts. You can write in them, underline passages, and make notes in the margins. Books can be enjoyed for generations. Show me a computer that's been passed down from grandfather to father to son, and isn't a paperweight. 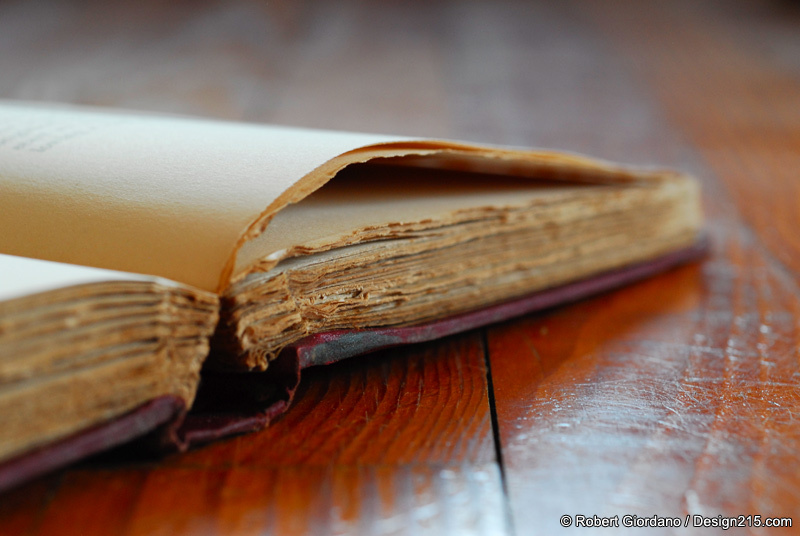 Many people like the tactile feel of a book and the process of turning physical pages. Many books have beautiful, full color photographs, reproductions, and illustrations. Books have lasted for hundreds of years. Electronic storage devices have not proven a lifespan past 50 years. Books can be dropped, stepped on, thrown against a wall, or stacked together and used as a step stool. Books are no less resistant to fire and water than electronic devices but they are more resistant to damage from sand, coffee, and EMPs. I'll end with this thought. In 1953, Ray Bradbury published a novel called Fahrenheit 451 about a dystopian future in which books are outlawed and anyone caught reading them is arrested. All books are confiscated and burned in order to dull the minds of the population. Bradbury's classic is his critique on an an increasingly dysfunctional American society. A device like the Kindle could motivate people to spend more time reading than watching mindless television. On the dark side, how much easier would it be to simply flip a switch and erase everything, instead of burning all the books? I spent another late night in Miami, editing web sites. 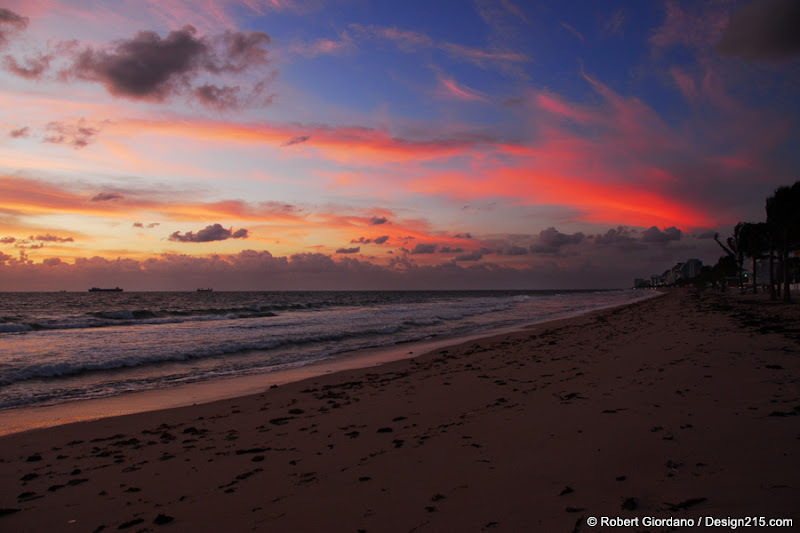 I returned to Fort Lauderdale a little after 6:30am and I decided to watch the sunrise before going to bed. What an amazing and peaceful moment it is to sit on the beach just before the sun comes up. Before people are engaged in their mad scramble to get to work. Before the beach is filled with tourists and retirees. Before the noise of the city overtakes the peaceful sound of the ocean. For a moment I imagine I am somewhere else, on a tropical island, far away from cell phones, clients, and venti mocha frappuccinos. I found this 1945 penny in my pocket today. I don't usually see coins this old still in circulation. Somehow this 63 year old penny found its way into my pocket. I sat on the beach at dusk, holding it between my thumb and forefinger, trying to imagine its journey. 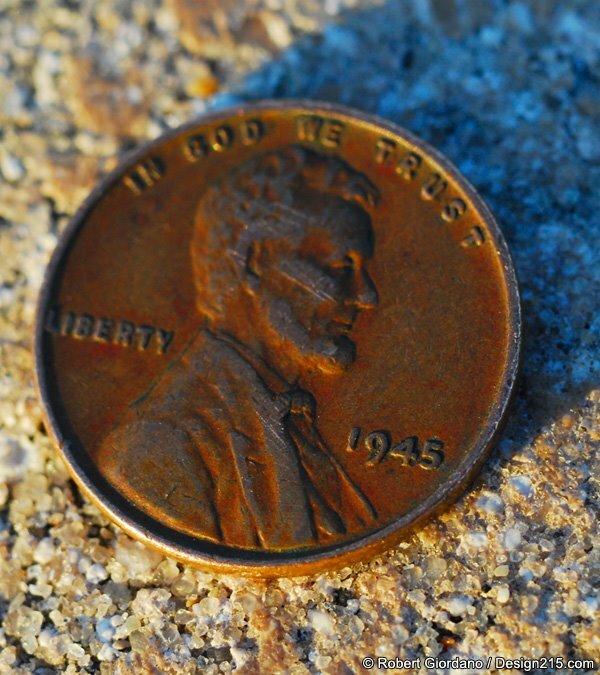 It was minted in 1945, the year World War II came to an end. Joe Rosenthal took the award winning photo of the Marines raising the American flag at Iwo Jima. President Franklin Delano Roosevelt died suddenly and Vice President Harry S. Truman became the 33rd President. Perhaps a reporter in Washington D.C. first acquired the penny as part of his change for a cup of coffee. In 1954, it could have been part of the 18 cents someone paid for a burger when the first Burger King opened here in Miami, Florida. I'm certain my penny was in someone's pocket at Woodstock in 1969. Perhaps it was in the change purse of a New York City hot dog vendor at the opening ceremony of the World Trade Center in 1973. I wonder how many pockets its been in, how many times it was lost between the cushions of someone's couch, how many times it was picked up off the ground as a token of good luck? Lincoln has been on the front side (the obverse) of the penny since 1909. My penny does not have the Lincoln Memorial on the reverse. That began in 1959. The copper in my penny is worth 2.65 cents. Today's pennies are 97% zinc with copper plating. 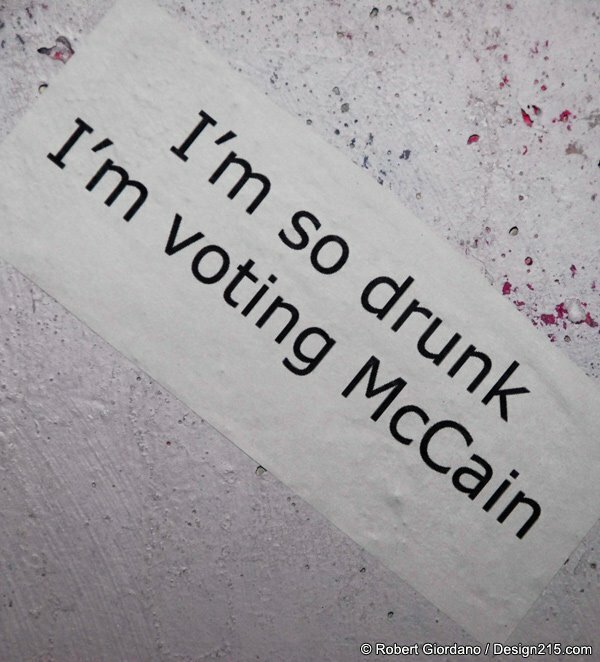 I was walking around the Design District in Miami and spotted this sticker on a concrete lamp post. So simple, yet so profound. Think about it. Here's my friend Laura at the Undergrounds Coffeehaus again, hiding behind some type of ceremonial death mask. 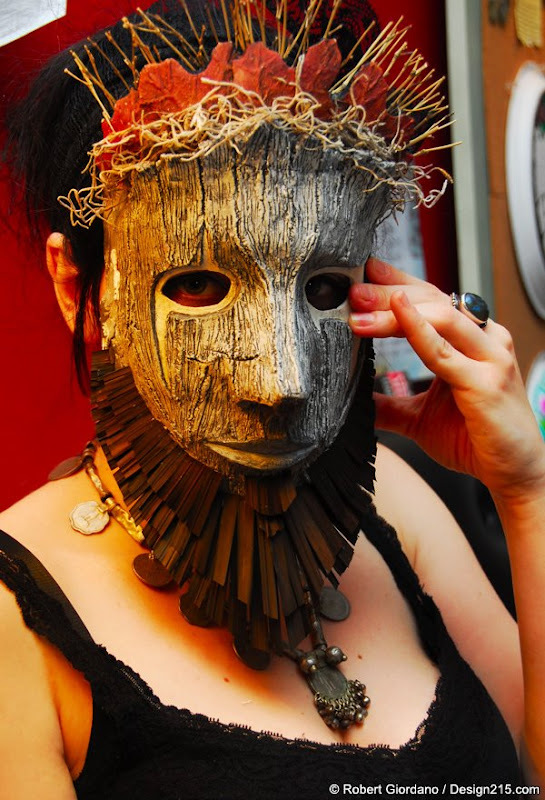 The mask is the handiwork of a local artist named Bill Landis, another frequent patron of the Coffeehaus. Undergrounds is open late every night except Monday when they're closed, and they're open till 1am on Friday and Saturday. The coffee is tasty and you never know what you're going to see there. I was working late at my friend David's facility in North Miami until around 5am. 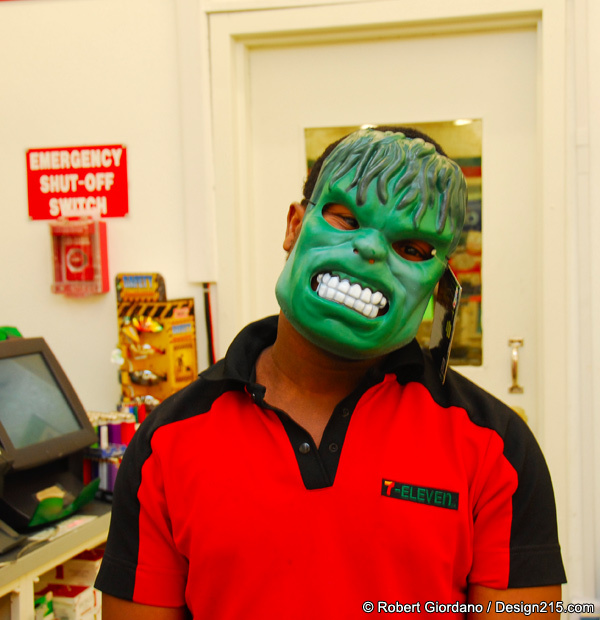 On the way home, I stopped at a desolate 7-Eleven on Dixie Highway. I went straight to the back and grabbed a large bottled water from the cooler. When I approached the counter, this is what I saw. For those of you who ask me why I always have my camera with me, I have just answered your question. 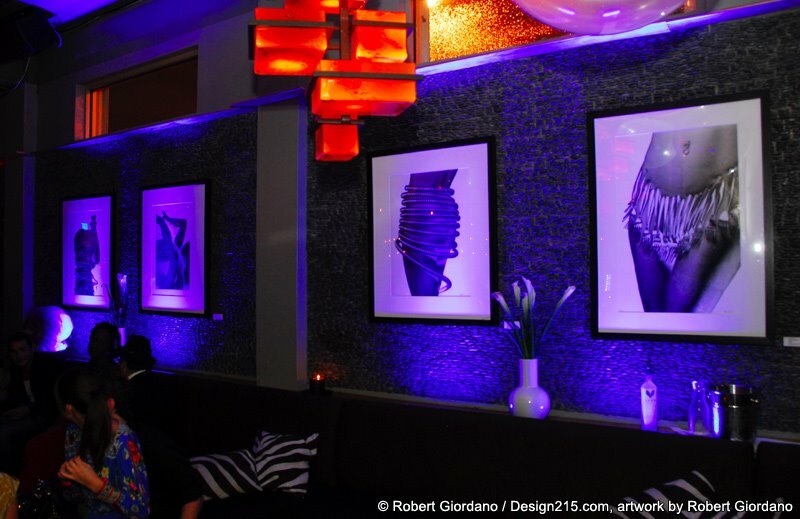 I stopped by The Vagabond in downtown Miami to see some of my artwork which is on display there. 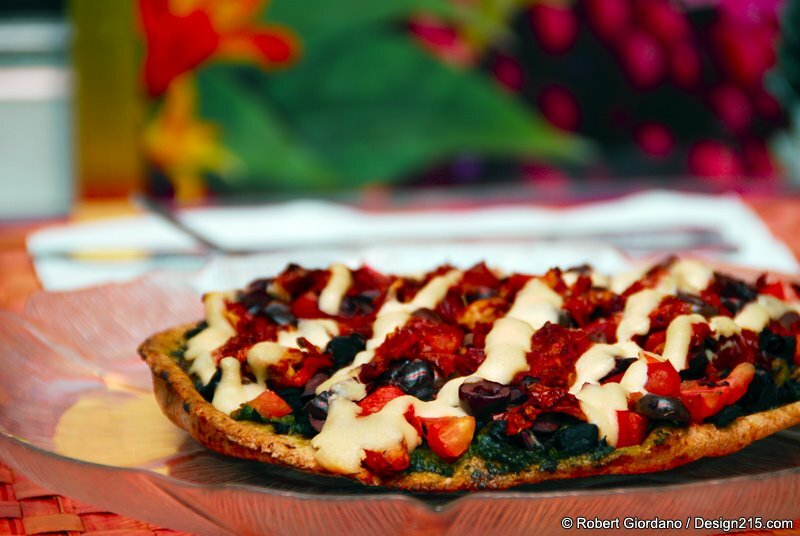 Saturday night I went to my friend's raw and vegan restaurant in Miami, Om Garden, and had an "almost" raw pizza. I say almost because its made from all raw vegetables but the crust is a pita which of course, is baked. On the menu, it is listed as "Peace Pizza" and consists of pesto, mushrooms, black olives, sun dried tomatoes, fresh tomatoes, and a raw topping made from nuts and olive oil. It was absolutely delicious. Welcome to the Church of Internal Combustion. 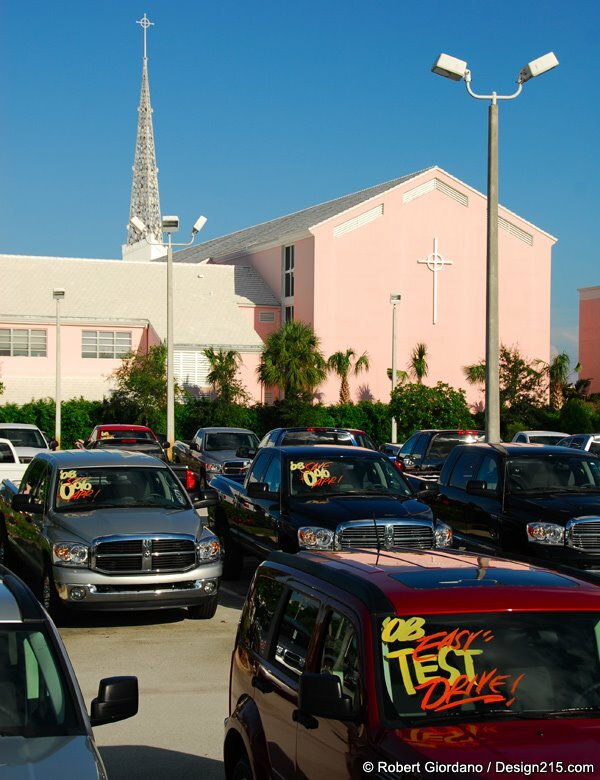 All you need to join our congregation is a new 2008 4WD Truck or SUV. Yes, we know this is Florida, where everything is flat and it never snows, but hey that four wheel drive is bound to come in handy! We are a Non-denominational Church. You can make your donation to any brand of gasoline pump you wish, but please support your church and donate often. Seriously, who killed the electric car?